Posted on October 1, 2012 by Patricia Tilton •	This entry was posted in National Bullying Prevention Month, Perfect Picture Books, Relational Aggression, Trudy Ludwig and tagged Behavior, Bullying, Relational Aggression. Bookmark the permalink. This sounds great and I’m impressed there’s no tidy ending because real life isn’t tidy, is it? Catherine, I think it is vital kids deal with the consequences of their behavior. Katie has to start over and hope that she can form better relationships. This sounds terrific, Pat. I like that it isn’t tidy, and that there are realistic consequences to the bullying behavior (though I hope it leaves kids with a sense that there’s room for change and growth and they can turn things around if they try.) Thanks for sharing! Yes Susanna, there is room for redemption. She did grow, but she had to start over and make new friends. I think writing a diary was brilliant. Sounds very real and constructive, Pat! Thanks Joanna, it is a very real and constructive follow-up to the first book. I’m glad Trudy wrote it. Great for classroom discussions and activities. Thanks Pat. Will pass this on to some teacher friends. Thanks Janie. It’s a good book for older kids. There can never be too many books about bullying. It just takes one to reach a real bully or a real victim. You never know which one it’ll be. Genevieve, I agree. There are so many books being written for a variety of age groups, and the subject is so much in the news. Like that many schools are developing anti-bullying program. I sometimes wonder if there is less bullying that goes on today than happened in my time. Schools seem to be much more aware of the problem. When I was young, I got victimized by a bully. That’s sad to know — don’t you wish you could show that bully what you’re doing now? I know bullying went on when I was a kid, but I don’t remember it being the extreme it is today, especially with social media involvement. There were stories about a teenager on the news today. I think we just looked at certain kids as mean and stayed away. But, I’m generations ahead of you. This book sounds excellent, as does the one that preceded it. I must read them. Thank you for sharing them, and thank you for highlighting Bullying Prevention Month. Beth, I love Trudy Ludwig’s books. She really has carved out a niche for herself. Her bullying books are excellent. You follow through this subject so well, Patricia. Bullying in all its angels needs to be exposed and recognised for what it is. Thank you Niamh. I’m trying to cover the various angles. Thanks for noticing. Bullying seems to be a growing problem in schools today. It’s nice to see a book that shows kids that how they treat others matters, and that there are consequences to their hurtful behavior. Nice review Pat! Thanks Amanda. I’m glad you liked the books I reviewed. Trudy is really an expert on the subject. I hope more schoools start anti-bullying programs and have zero tolerance. This is an important book. I like the format. Both the books are great together! Kids can learn a lot from them. 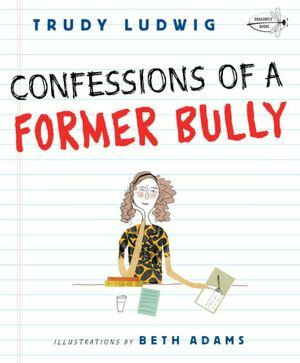 Thank you Pat, for your wonderful reviews of my two books, My Secret Bully and Confessions of a Former Bully. They were truly labors of love for me. I strongly believe that if we can address bullying at an earlier age, providing school communities with the tips, tools and resources they need to create safer, more caring school climates, bullying won’t be as prevalent. Thank you for leaving a comment. It has been a pleasure to review your books and a wonderful way to kick off National Bully Prevention Month. I hope you enjoy my review of Trouble Talk on Friday. I know this subject is important to you and I wish you much success in your endeavor to provide schools and communities with the right tools to bring change. Great book on an important issue, Pat. Kids need to know bullying doesn’t only mean ‘pushing.’ Verbal abuse can hurt a lot more than a shove sometimes. Thanks for sharing this review! Claudine, I’m glad you enjoyed the book. I agree, verbal abuse, especialy from a best friend, can be very hurtful. Thanks for stopping. Excellent review Pat. Another book that I need to check out. Thanks for bringing them to my attention. So glad you liked the book Diane. It was a unique take on the subject. Great review Patricia. I agree it’s important for the kids to be able to talk about both perspectives! Coleen, glad you enjoyed the review. Loved the different perspective.